From 1815, the church met in Old King Street, approximately where British Home Stores is located in Broadmead today. 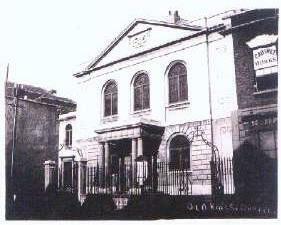 After the severe bombing in World War 2, the church was relocated to Cairns Road, where we are today. In the early years, the church suffered persecution as they stood against laws that forbad freedom of expression and gathering to worship and then against the slave trade, for which Bristol was renowned. In the early 1800’s the church started in earnest to reach out to young children who were poor and had no opportunity of education. Many thousands of children were helped over the years. He was instrumental in the formation of the Bristol Baptist Itinerant Society at Old King Street, under whose auspices 17 churches were formed in or around Bristol. Amongst other things, he worked with the Act of Emancipation in 1824, of slaves in the British Colonies and also championed the cause of slaves in America. He visited more than 170 prisoners under sentence of death; attended 45 to their executions; and represented many more at their trials, leading to commutation of their sentences. His most famed prisoner is John Horwood, whose remains were finally buried with his father and brother at Hanham at 1.30pm on 13th April 2011 – 190 years to the minute of his death by hanging in 1821. His skeleton had been keep for many years at the University, until his descendents found it while tracing their family history. You may have heard about this on the UK news. We have extensive archives recording the history of the church – some very moving accounts, and some amusing ones too! If you are interested in our history, please let us know and we can direct you to more information. Our history is still in the making! We believe that history has a part in shaping who we are today, and as a church, we are keen to understand our own story as a church family, and continue to stand up for those for whom Jesus died.